When these two forms of directives are taken together, Obama is on track to take more high-level executive actions than any president since Harry Truman battled the “Do Nothing Congress” almost seven decades ago, according to a USA TODAY review of presidential documents. Obama has issued executive orders to give federal employees the day after Christmas off, to impose economic sanctions and to determine how national secrets are classified. He’s used presidential memoranda to make policy on gun control, immigration and labor regulations. Tuesday, he used a memorandum to declare Bristol Bay, Alaska, off-limits to oil and gas exploration. Obama has issued 195 executive orders as of Tuesday. Published alongside them in the Federal Register are 198 presidential memoranda — all of which carry the same legal force as executive orders. He’s already signed 33% more presidential memoranda in less than six years than Bush did in eight. He’s also issued 45% more than the last Democratic president, Bill Clinton, who assertively used memoranda to signal what kinds of regulations he wanted federal agencies to adopt. Obama is not the first president to use memoranda to accomplish policy aims. But at this point in his presidency, he’s the first to use them more often than executive orders. So even as he’s quietly used memoranda to signal policy changes to federal agencies, Obama and his allies have claimed he’s been more restrained in his use of that power. “There is no question that this president has been judicious in his use of executive action, executive orders, and I think those numbers thus far have come in below what President George W. Bush and President Bill Clinton did,” said Jay Carney, then the White House press secretary, in February. “It is funny to hear Republicans get upset about the suggestion that the president might use legally available authorities to advance an agenda that expands opportunity and rewards hard work and responsibility, when obviously they supported a president who used executive authorities quite widely,” he said. • In his State of the Union Address in January, Obama proposed a new retirement savings account for low-income workers called a MyRA. The next week, he issued a presidential memorandum to the Treasury Department instructing it to develop a pilot program. • In April, Obama directed the Department of Labor to collect salary data from federal contractors and subcontractors to monitor whether they’re paying women and minorities fairly. • In June, Obama told the Department of Education to allow certain borrowers to cap their student loan payments at 10% of income. They can also be controversial. Obama issued three presidential memoranda after the Sandy Hook school shooting two years ago. They ordered federal law enforcement agencies to trace any firearmthat’s part of a federal investigation, expanded the data available to the national background check system, and instructed federal agencies to conduct research into the causes and possible solutions to gun violence. Two more recent memos directed the administration to coordinate an overhaul of the nation’s immigration system — a move that congressional Republicans say exceeded his authority. Of the dozens of steps Obama announced as part of his immigration plan last month, none was accomplished by executive order. Executive orders are numbered — the most recent, Executive Order 13683, modified three previous executive orders. Memoranda are not numbered, not indexed and, until recently, difficult to quantify. Kenneth Lowande, a political science doctoral student at the University of Virginia, counted up memoranda published in the Code of Federal Regulations since 1945. In an article published in the December issue of Presidential Studies Quarterly, he found that memoranda appear to be replacing executive orders. Indeed, many of Obama’s memoranda do the kinds of things previous presidents did by executive order. • In 1970, President Nixon issued an executive order on unneeded federal properties. Forty years later, Obama issued a similar policy by memorandum. • President George W. Bush established the Bob Hope American Patriot Award by executive order in 2003. Obama created the Richard C. Holbrooke Award for Diplomacy by memorandum in 2012. • President Bush issued Executive Order 13392 in 2005, directing agencies to report on their compliance with the Freedom of Information Act. On his week in office, Obama directed the attorney general to revisit those reports — but did so in a memorandum. 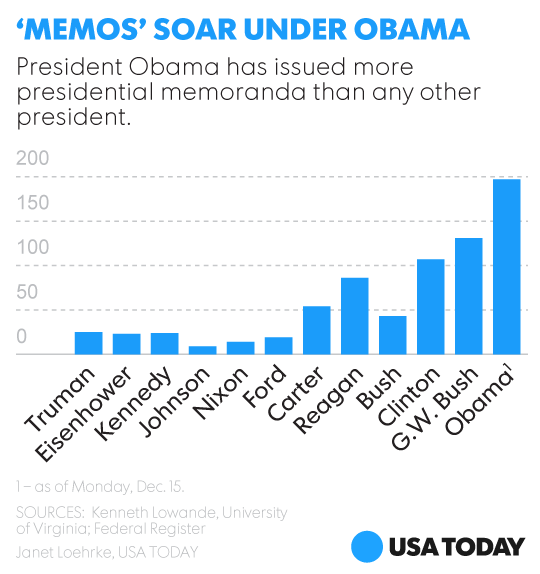 “If you look at some of the titles of memoranda recently, they do look like and mirror executive orders,” Lowande said. The difference may be one of political messaging, he said. An “executive order,” he said, “immediately evokes potentially damaging questions of ‘imperial overreach. '” Memorandum sounds less threatening. Though they’re just getting attention from some presidential scholars, White House insiders have known about the power of memoranda for some time. In a footnote to her 1999 article in the Harvard Law Review, former Clinton associate White House counsel Elena Kagan — now an Obama appointee to the U.S. Supreme Court — said scholars focused too much on executive orders rather than presidential memoranda. There are subtle differences. Executive orders are numbered; memoranda are not. Memoranda are always published in the Federal Register after proclamations and executive orders. And under Executive Order 11030, signed by President Kennedy in 1962, an executive order must contain a “citation of authority,” saying what law it’s based on. Memoranda have no such requirement. Obama, like other presidents, has used memoranda for more routine operations of the executive branch, delegating certain mundane tasks to subordinates. About half of the memoranda published on the White House website are deemed so inconsequential that they’re not counted as memoranda in the Federal Register. Sometimes, there are subtle differences. President Eisenhower signed Executive Order 10789 in 1958 giving emergency contracting authority to the Department of Defense and other Cabinet departments. President Bush added other departments in 2001 and 2003, but he and Obama both used memoranda to give temporary authority to the U.S. Agency for International Development to respond to crises in Iraq and western Africa. When the president determines the order of succession in a Cabinet-level department — that is, who would take over in the case of the death or resignation of the secretary — he does so by executive order. For other agencies, he uses a memorandum. 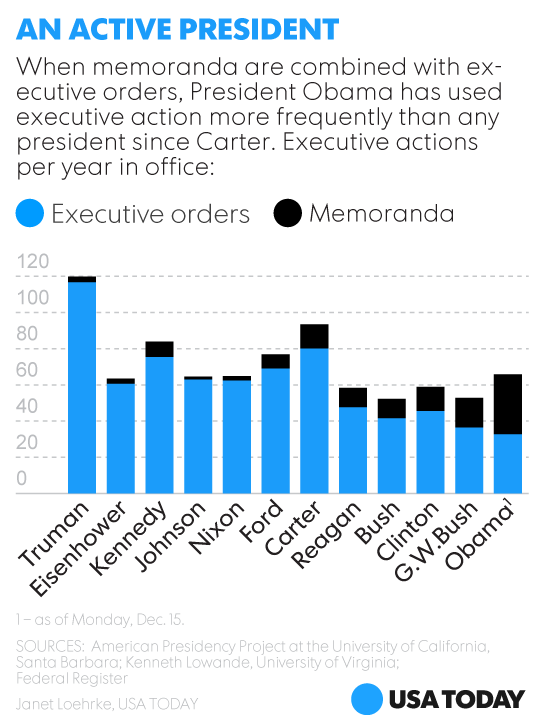 Both executive orders and memoranda can vary in importance. One executive order this year changed the name of the National Security Staff to the National Security Council Staff. Both instruments have been used to delegate routine tasks to other federal officials. Whatever they’re called, those executive actions are binding on future administrations unless explicitly revoked by a future president, according to legal opinion from the Justice Department. The Office of Legal Counsel — which is responsible for advising the president on executive orders and memoranda — says there’s no difference between the two. “It has been our consistent view that it is the substance of a presidential determination or directive that is controlling and not whether the document is styled in a particular manner,” said a 2000 memo from Acting Assistant Attorney General Randolph Moss to the Clinton White House. He cited a 1945 opinion that said a letter from President Franklin Roosevelt carried the same weight as an executive order. Even the White House sometimes gets tripped up on the distinction. Explaining Obama’s memoranda on immigration last month, Press Secretary Josh Earnest said the president would happily “tear up his own executive order” if Congress passes an immigration bill. Obama had issued no such executive order. Earnest later corrected himself. “I must have misspoke. I meant executive actions. So I apologize,” he said.